Deploy a single, flexible solution that enables new business practices and breaks down ecosystem barriers. Today, your employees and resources can be anywhere in the world. Colleagues expect seamless access to applications and data whether working from home or on the road. 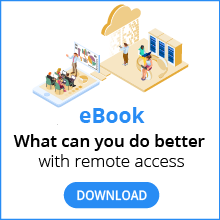 VNC Connect delivers secure remote access that connects your people to business-critical resources, sharing and collaborating more efficiently. An explosion of inexpensive devices is changing the way your business and employees interact. BYOD creates exciting new business opportunities, but it also creates new IT support challenges. VNC Connect allows your IT team to support a wide range of devices, capitalizing on the benefits of a BYOD world. The traditional boundaries between your internal teams, suppliers and customers are rapidly eroding. Information and systems must be shared between internal and external stakeholders for your business to thrive. VNC Connect enables everyone in your business ecosystem to securely assess the resources they need to succeed. It’s common for a business to have numerous remote access products. This tactical accumulation increases your costs and creates a significant maintenance and training burden, while exposing you to greater security risk. A single subscription saves you money and requires less resource to manage. One product for remote access and support simplifies business processes and reduces friction. Less software reduces your attack footprint and supports compliance objectives. Seamless deployment using standard tooling, and convenient management of computers, people and roles. No special training required for all the people in your team to connect and take control. Full session encryption, multi-factor authentication and many other security features. Supports a wide range of use cases, not just the IT helpdesk. Enables remote access to the latest platforms and your legacy systems. Thousands of companies rely on VNC Connect every day to improve operational efficiency, expand their business ecosystem and enable innovative new services and revenue streams.